What’s the Real Takeaway From Yesterday’s Big Low-Carb vs. Low-Fat Showdown? A new study, published Tuesday in JAMA…found that people who cut back on added sugar, refined grains and highly processed foods while concentrating on eating plenty of vegetables and whole foods — without worrying about counting calories or limiting portion sizes — lost significant amounts of weight over the course of a year….The research lends strong support to the notion that diet quality, not quantity, is what helps people lose and manage their weight most easily in the long run. It also suggests that health authorities should shift away from telling the public to obsess over calories and instead encourage Americans to avoid processed foods that are made with refined starches and added sugar. This was not my emphasis. I led with the comparison of low-fat and low-carb diets. Why the difference? We did not “prescribe” a specific caloric restriction. We focused on reducing foods high in fats or foods high in carbs, and we advised the participants that they needed to find the lowest level of fat or carb intake they could achieve while not feeling hungry….We wanted for them to find a new eating pattern they could maintain without even thinking of it as a “diet”….Table 2 in the paper shows that the participants reported “achieving” a ≈500 calorie deficit, without us prescribing one … and it was fairly consistent through the 12 months. Now, I honestly think they likely exaggerated the caloric restriction. But in fact they did lose >6,500 lbs collectively…So they must have eaten less. I think this is an important area to explore. …well, as near as I can tell, you’ll probably still fall off the wagon eventually. But it will take longer. In any case, there’s exactly zero that’s new here. And the general advice to eat more vegetables and cut back on processed foods, added sugar, and refined grains is likewise of longstanding. My take is that there’s just nothing new in this part of the study. What’s new is comparing low-fat to low-carb diets in a fairly rigorous way, and then checking the insulin secretion theory of the low-carb diet. So that’s what I emphasized. POSTSCRIPT: There’s still the question of why a low-carb or low-fat diet leads to lower calorie consumption. 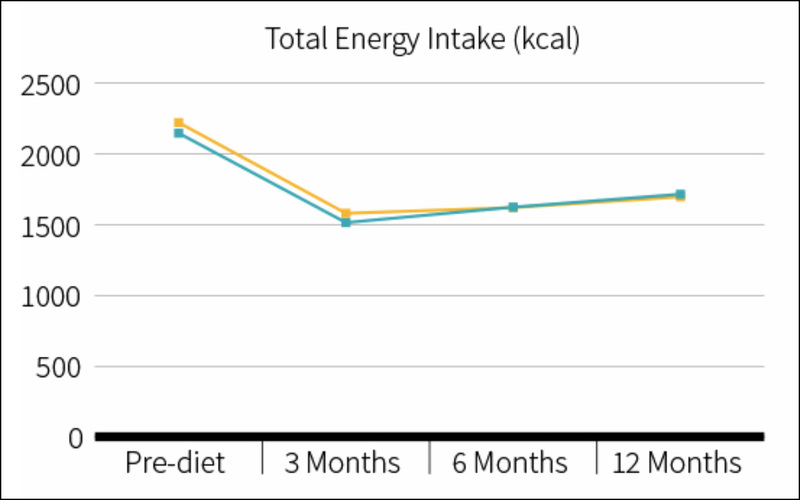 One theory is that as you get used to it, your hunger decreases and you just naturally eat less. Another theory is that these diets are pretty boring and make eating less attractive. Yet another theory is that carbs and fats are the main sources of calories in American diets, so if you significantly cut back on one or the other you’re almost certain to cut back on calories too. It takes a helluva lot of vegetables to make up for not eating meat or bread, and few people are that crazy for vegetables. In any case, if you cut back on something with lots of calories, you’re cutting back on calories. As I said yesterday, “As near as I can tell, the bottom line is that if you want to lose weight, eat less.” The big difference between me and the New York Times is that they made this the lead, while I made it my last paragraph.